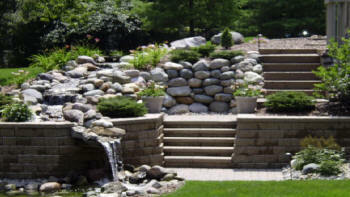 Maryland retaining walls. Install/Build Maryland Residential Retaining Walls Erosion Control Cost Home Yard Wall Contractor Replace/Repair Concrete Allan Block Brick Stone Timber We install Stone Brick Concrete or Timber retainer walls, if that is what your project needs. No matter the height of the wall or the materials being used, we can build a retaining wall that will resist the Maryland Drainage System Retaining Walls Maryland Erosion Control Install/Build Cost Maryland Residential Home Yard Wall Contractor Replace/Repair Concrete Allan Block Brick Stone Timber The most important consideration in proper design and installation of retaining walls is that the retained material is attempting to move forward and down slope due to gravity. This creates a soil pressure behind the walls are buttressed on the front, or include a counter fort on the back, to improve their stability against high loads. Buttresses are short wing walls at right angles to the main trend of the wall. These walls require rigid concrete footings below seasonal frost depth. This type of wall uses much less material than a traditional gravity wall. Install/Build Cost Residential Home Yard Maryland Wall Contractor Replace/Repair Concrete Maryland Allan Block Brick Stone Timber. Built our Retaining Walls and Outdoor Patio Fireplace.